The Tomistoma crocodile (Tomistoma schlegelii) is a unique species restricted to Sumatra in western Indonesia, Borneo, and peninsular Malaysia. It is often called Flase Gharial and ranks under the IUCN Red Book of Endangered Species as one of the top five crocodile species for highest-priority conservation and research action. Prior to 1996, very little was known of the Tomistoma ecology, distribution, abundance, or conservation status. In 1995-96, the first major field assessment of the species’ biology and status was carried out by Wildlife Management International and the Indonesian Ministry of Forestry, in Sumatra. This led to the species being listed as “Endangered” by the IUCN in 1998. In 2001 and 2002, international funding enabled additional research on the species to quantify trends in status and conservation threats. This research, followed by PRCF surveys in West Kalimantan in 2004 and later in 2014 and 2015 suggest a continuous decline of the crocodile. There are no current estimates of the number of Tomistoma remaining in the wild. Historically, Tomistoma skins were used in trade, and their meat and eggs were collected for human consumption. Today the crocodile is more threatened by the severe depletion of its critical nesting habitat, as their capture and trade is less common. Swamp forests in which Tomistoma live are becoming fragmented and reduced due to commercial and illegal logging, expansion of agriculture, forest fires, and swamp draining for forestry and construction purposes. 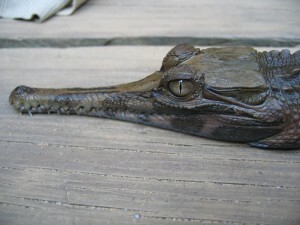 Kalimantan is thought to possibly hold the largest global Tomistoma populations. PRCF surveys have concentrated at the Danau Sentarum landscape in West Kalimantan, where adults, juveniles, and nests have been found, together with skins and captive crocodiles. Through our research, we have identified local threats, and areas critical for conservation of Tomistoma in the Sentarum Lakes. Our surveys are used as a foundation to define and facilitate conservation management efforts.